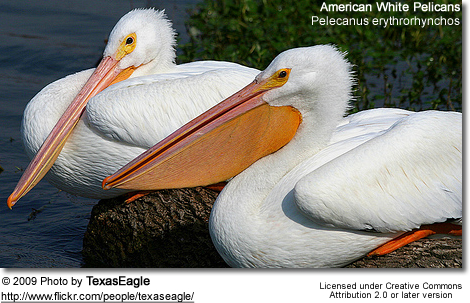 The American White Pelican or Rough-billed Pelican (Pelecanus erythrorhynchos) is a large aquatic bird from the order Pelecaniformes. It breeds in interior North America, moving south and to the coasts, up to Central America, in winter. 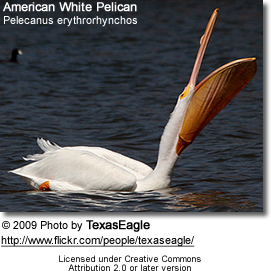 The scientific name means "red-billed pelican", from the Latin term for a pelican, Pelecanus, and erythrorhynchos, derived from the Ancient Greek words erythros (?????? ?, "red") + rhynchos (????? ?, "bill"). It is a very large and plump bird; its overall length is about 50–67 inches (130–170 cm), courtesy of the huge beak which measures 13–14.4 inches (330–370 mm) in males and 10.4–13 in (260–330 mm) in females. It has a wingspan of about 95–120 in (240–300 cm) and weighs between 11 and 20 lb (5.0 and 9.1 kg). The plumage is almost entirely bright white, except the black primary and secondary remiges (large flight feathers), which are hardly visible except in flight. From early spring until after breeding has finished in mid-late summer, the breast feathers have a yellowish hue. After moulting into the eclipse plumage, the upper head often has a grey hue, as blackish feathers grow between the small wispy white crest. The bill is long and flat, with a large throat sac, and in the breeding season vivid orange like the iris, the bare skin around the eye, and the feet. In the breeding season, there is a laterally flattened "horn" on the upper bill, about one-third the bill's length behind the tip. This is shed off after the birds have mated and laid their eggs, and outside the breeding season the bare parts become duller in color, with the naked facial skin yellow and the bill, pouch and feet an orangy-flesh color. Apart from the difference in size, males and females look exactly alike. Immature birds have light grey plumage with darker brownish nape and remiges. Their bare parts are dull grey. Hatchlings are naked at first, then grow white down feathers all over, before moulting to the immature plumage. 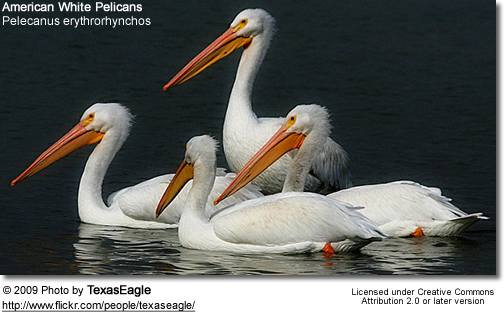 American White Pelicans nest in colonies of several hundred pairs on islands in remote brackish and freshwater lakes of inland North America. The most northerly nesting colony can be found on islands in the rapids of the Slave River between Fort Fitzgerald, Alberta and Fort Smith, Northwest Territories. About 10-20% of the population uses Gunnison Island in the Great Basin's Great Salt Lake as a nesting ground. The southernmost colonies are in southwestern Ontario and northeastern California. They winter on the Pacific and Gulf of Mexico coasts from central California and Florida south to Panama, and along the Mississippi river at least as far north as St. Louis, Missouri. In winter quarters, they are rarely found on the open seashore, preferring brackish estuaries and lagoons. They cross deserts and mountains but avoid the open ocean on migration. But stray birds, often blown off course by hurricanes, have been seen in the Caribbean. In Colombian territory it has been recorded first on February 22, 1997, on the San Andrés Island, where they might have been swept by Hurricane Marco which passed nearby in November 1996. Since then, there have also been a few observations likely to pertain to this species on the South American mainland, e.g. at Calamar. 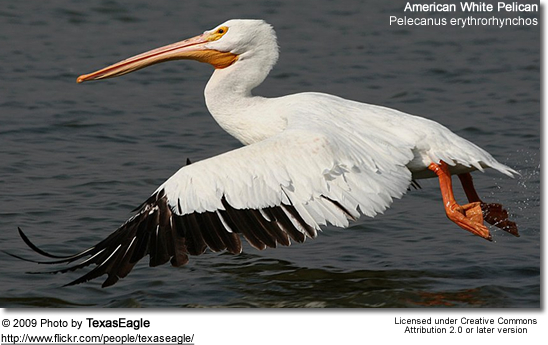 Unlike the Brown Pelican (P. occidentalis), the American White Pelican does not dive for its food. Instead it catches its prey while swimming. 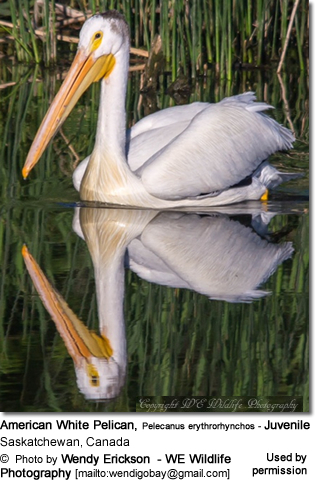 Each bird eats more than 4 pounds of food a day, mostly fish such as Cypriniformes like Common Carp (Cyprinus carpio), Lahontan Tui Chub (Gila bicolor obesa) and shiners, Perciformes like Sacramento Perch (Archoplites interruptus) or Yellow Perch (Perca flavescens), Salmoniformes like Rainbow Trout (Oncorhynchus mykiss), Siluriformes (catfish), and jackfish. Other animals eaten by these birds are crayfish and amphibians. 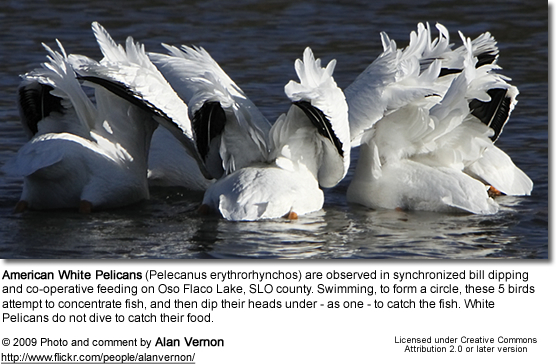 Birds nesting on saline lakes, where food is scarce, will travel great distances to better feeding grounds. 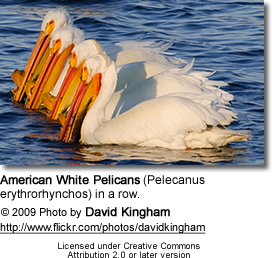 American White Pelicans like to come together in groups of a handful of birds or so to feed, as they can thus cooperate and chase fish to one another. When this is not easily possible – for example in deep water, where fish can escape by diving out of reach –, they prefer to forage alone. 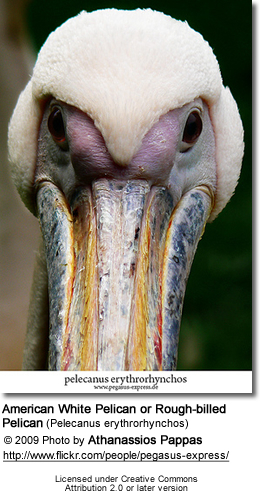 But the birds also steal food on occasion, sometimes from other pelicans, sometimes from gulls. As noted above, they are colonial breeders, with up to 5,000 pairs per site. The birds arrive on the breeding grounds in March or April; nesting starts between early April and early June. The nest is a shallow depression scraped in the ground, in some twigs, sticks, reeds or similar debris have been gathered. After about one week of courtship and nest-building, the female lays a clutch of usually 2 or 3 eggs, sometimes just one, sometimes up to six. Both parents incubate for about 4 weeks to one month. The young leave the nest 3–4 weeks after hatching; at this point, usually only one young per nest has survived. They spend the following month in a creche or "pod", moulting into immature plumage and eventually learning to fly. After fledging, the parents care for their offspring some three more weeks, until the close family bond separates in late summer or early fall, and the birds gather in larger groups on rich feeding grounds in preparation for the migration to the winter quarters. They migrate south by September or October. Habitat loss is the largest known cause of nesting failure, with flooding and drought being recurrent problems. Predation by coyotes, ravens and gulls is common. Human-related losses include entanglement in fishing gear, boating disturbance and poaching as well as additional habitat degradation. 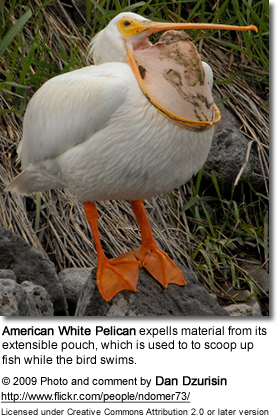 There was a pronounced decline in American White Pelican numbers in the mid-20th century, attributable to the excessive spraying of DDT, endrin and other organochlorides in agriculture as well as widespread draining and pollution of wetlands. But populations have recovered well after stricter environmental protection laws came into effect, and are stable or slightly increasing today. 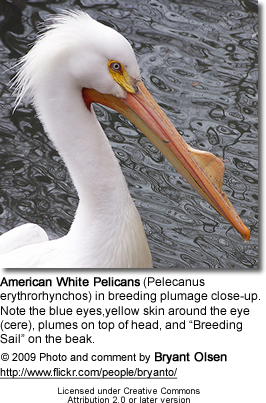 Around 1980s, more than 100,000 adult American White Pelicans were estimated to exist in the wild, with 33,000 nests altogether in the 50 colonies in Canada, and 18,500 nests in the 14-17 United States colonies. Shoreline erosion at breeding colonies remains a problem in some cases, as are the occasional mass poisonings when pesticides are used near breeding or wintering sites. BirdLife International (BLI) (2008). In: IUCN 2008. IUCN Red List of Threatened Species. Downloaded on 28 December 2008. 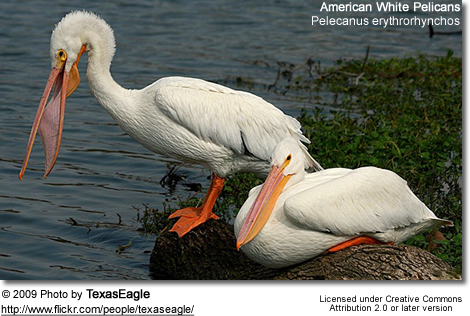 Estela, Felipe A.; Silva, John Douglas and Castillo, Luis Fernando (2005): El pelícano blanco americano (Pelecanus erythrorhynchus) en Colombia, con comentarios sobre los efectos de los huracanes en el Caribe [The American White Pelican (Pelecanus erythrorhynchus) in Colombia, with comments on the effects of Caribbean hurricanes]. Caldasia 27(2): 271- 275 [Spanish with English abstract].